The telephone had long since established the workable principle of converting sound patterns into an electrical facsimile, a pulsing electrical current converted into sound. As a matter of fact, a telephone-style system of recording by electricity was tinkered with far back in the early days, toward the close of the last century, but it came to not thing. electricity really came into the recording process in a sudden burst of development as a result of the radio and its newly developed vacuum tube amplifier. Electricity saved the phonograph from death at the hands of its new rival. But it was radio which made it possible. Electricity did two vital things for recording. First, it made possible the amplification of sound patterns to any degree. A tiny current in the electronic vacuum tube could be used to control an enormously larger current, which there-by took on the pattern of the smaller. This was utterly new and entirely revolutionary. Amplification could be applied at both ends of the recording system. At the recording end it was suddenly possible to record tiny sounds, and at any convenient distance, without recourse to the old shouting; for now the microphone, converting small sounds into small electric currents, fed an amplifier which enlarged them prodigiously-as prodigiously as might be desirable, before recording even occurred. The recording stylus now moved in step with this conveniently larger current, and the old dependence on the actual power of the original sound was gone forever. Now any orchestra could be recorded at a comfortable and natural distance from the new microphone, the "little ear," and this even during pianissimo playing. The whole art of recording was revolutionized almost overnight. There was practically no limit to the kinds of musical sound which might now be successfully taken down-no limit, at least, in respect to volume or distance. With amplification, the microphone became more sensitive than any ear. There was no more shouting into mechanical trumpets, no more close-range concentration. 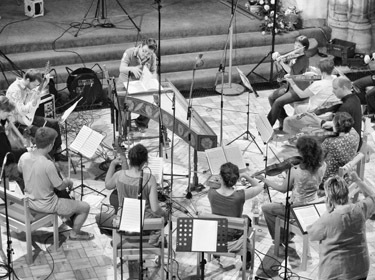 Recording sessions blossomed from tight huddles about a horn into the spaciousness of big studios and concert halls and opera houses. The second advantage that electricity brought is one that we have already briefly touched upon and will again. Only now, after a quarter century, are its benefits being fully realized. By removing major sections of the recording and reproducing process from the mechanical into the electrical form of vibration, most of the difficulties of forced mechanical vibration were avoided. The new medium of transmission had, as we have said, no mass or weight or substance and could respond with unprecedented accuracy to the sound patterns "heard" by the microphone or pressed into the record grooves. The first part-electric recordings, and the part-electric phonographs soon introduced to match them, immediately extended the tonal range and the fidelity of the whole recording system far beyond anything previously possible. Unlimited sensitivity in the picking up of sound, unlimited volume in the reproduction of records, and unprecedented faithfulness-these were the exciting stimulants that brought the phonograph record industry into its second great period of expansion, the climax of which could only be said to have come with the advent of the microgroove records a few years ago. The electrical method of disk recording, first used in the middle 1920s, persisted with no more than superficial technical improvements until shortly before World War II. It was basically a simpler process than we use today; most of it has been incorporated into the longer and more elaborate series of operations that produced LP and 45 rpm microgroove disks. Before that, until about 1940, the original disk recording made by the artist was, in its mass-produced multiple image, the record that actually reached your home. Scratch marks on the original was as faithfully reproduced in your shellac pressing as any record groove; you received an actual molding of the disk original, and there was practically nothing that could be done to alter that original recording between its cutting and the making of the finished commercial disk. The die was cast, almost literally, at the start. The electrical recording system introduced not one but four of those key elements. They are called transducers - converters of the musical intelligence from one medium to another. The Microphone: Air sound waves into electrical pulses. The Cutting Head: Electrical pulses into lateral stylus vibrations. The Phonograph Pickup Lateral Stylus: Vibrations into electrical pulses. The Loudspeaker: Electrical pulses into air sound waves. You will note that each transducer passes its product on to the next. The intelligence involved, the "signal" as sound men call it, goes along from one to the other, ideally unchanged. The arresting and storing up of time occurs in the record between numbers 2 and 3 as an intermediate step in the chain; from 1 to 2 and from 3 to 4, time is virtually unchanged, the "time lag" being as infinitesimal as the speed of electricity can make it. Were one to substitute in his chain a different species of transducer, say a radio transmitter and a receiver, in place of 2 and 3, the chain would still exist, beginning and ending as before in actual sound waves; but minus the record, minus the transducing of time itself, the two sets of sound waves at each end would occur simultaneously; the original and reproduced times would, to all intents and purposes, be the same. So with a live radio broadcast. So much for the semi-theoretical - shall we say, philosophical? - side of disk recording. Perhaps those readers of a non-mechanical bent will prefer to leave the whole business on this somewhat idealistic plane. Enough said.